Lassus was one of the most prolific of all Renaissance composers, writing an extraordinary quantity of music of high quality and in an exceptionally wide range of styles. Only a handful of Lassus' contemporaries begin to approach his compositional refinement and scarcely any can match his innate ability to express the meaning of a text so clearly. This skill comes to the fore in these setting of the seven Penitential Psalms, texts which held an important place in the liturgy during the Church's build-up to Easter. These are works of a profoundly gloomy nature. Each Psalm takes its 'mode' (or 'tonality') from one of the sequence of eight 'modes' by which plainchant had come to be categorized. Lassus solves the problem of what to do with the eighth mode by amalgamating two of the so-called 'Laudate' Psalms (those beginning with the word 'Laudate'—an instruction to the people to praise God) into a work full of vitality. 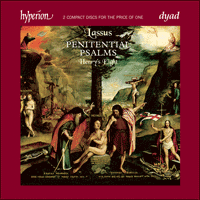 Although having absolutely no liturgical link with the Penitential Psalms, Lassus published all eight works together, perhaps exactly because they are so different in mood. Orlande de Lassus was born at Mons, in Hainaut, in 1532 and died in Munich on 14 June 1594. He was one of the most gifted, prolific and cosmopolitan composers of his time. Although legend has it that he was three times abducted because of the beauty of his voice, there is in fact little definite evidence either about his antecedents or his early life. The first attested fact is that, at about the age of twelve, he entered the service of Ferrante Gonzaga, a general in the service of Charles V. Gonzaga was in the Low Countries in the summer of 1544 and, when he returned south, it seems likely that Lassus accompanied him back to Italy where he visited Mantua in 1545. Gonzaga then went to Milan and it is thought that Lassus spent the years from 1547 to 1549 there. After a period in Naples, Lassus moved to Rome where he was appointed Maestro di Cappella at St John Lateran in 1553 as the immediate predecessor of Palestrina in that post. He left this appointment after little over a year to return to his homeland where his parents were ill, only to find on his arrival that they had both died. Lassus is next heard of in Antwerp in 1555 where Susato printed a first collection of his music. In the following year Lassus received and accepted an invitation to join the court of Duke Albrecht V of Bavaria in Munich, where he was engaged as a tenor under the then Maestro di Cappella Ludwig Daser. In 1563, when Daser retired, Lassus succeeded him as Maestro, beginning a thirty-year period in the post which ended only with his death in 1594. Lassus wrote an extraordinary quantity of music of high quality and in an exceptionally wide range of styles. He was held in very high regard in his lifetime, particularly by his employers, the Duke Albrecht and subsequently his son and heir Wilhelm, with whom Lassus conducted a lively correspondence, sometimes in a mixture of languages. He was evidently valued not just as a gifted and extremely inventive musician but also as an amusing and diverting companion. He achieved international fame, won several international competitions for musical composition, and received honours from the Emperor Maximilian, who ennobled him and granted him a coat of arms in 1570, and from Pope Gregory XIII, who created him a Knight of the Golden Spur in Rome in 1574. Psalmody, the singing of Psalms (Greek psalmodia originally meaning singing accompanied by the striking or plucking of a stringed instrument) was a central and well-established feature of Jewish religion when it was taken into the worship of the early Christian Church. It spread rapidly over the Christian world and we have accounts from the third century testifying to how widespread the practice had become. Members of the clergy and the monastic orders were expected to commit the whole Psalter to memory. The monastic orders, especially the Benedictines, promoted the incorporation of the Book of Psalms into the Western Liturgy so that all 150 Psalms were recited each week, a practice which continued in the Roman Catholic Church until the 1971 revision of the Breviary which provides instead for a monthly cycle of Psalm readings. In the Anglican Church the Psalms have traditionally been said on a monthly basis and psalmody has been an important feature of the Continental Protestant and English Nonconformist tradition. In addition to forming part of the Divine Office in this way, the Psalms have provided the major source of the texts of the Mass Propers, such as the Introit, Gradual, Offertory and Communion, which vary according to the season of the Church Year and are inserted between the unvarying texts of the Mass Ordinary—the Kyrie, Gloria, Credo, etc. The seven Penitential Psalms are a group of Psalms, numbers 6, 32, 38, 51, 102, 130, and 143 in the Anglican numbering (in the Vulgate all except Psalm 6 are numbered one digit lower), which have been in liturgical use for penitential prayer since early Christian times and, in the later Middle Ages, were prescribed to be recited after Lauds on Fridays in Lent. In the Book of Common Prayer they are appointed as Proper Psalms for Ash Wednesday, the first three at Matins, Psalm 51 at the Commination and the last three at Evensong. In the post-Tridentine Roman Catholic liturgy, as established by the Missal issued by Pius V in 1570, more extensive use is made of the Penitential Psalms; this is described below under the heading of each Psalm. The Munich Court, which had hitherto followed the rite of the diocese of Freising, adopted the Tridentine liturgy at Christmas 1581. Lassus made settings of all the seven Penitential Psalms together with the two Laudate Psalms, Laudate Dominum de caelis (Psalm 148) and Laudate Dominum in sanctis eius (Psalm 150). They first appeared, shortly after his appointment as Maestro in 1563, in the form of two sumptuously produced manuscripts, lavishly decorated and adorned by superb illuminations by the Munich court painter Hans Mielich. They were copied between 1565 and 1571 and were reserved for use by Duke Albrecht. Two companion volumes of commentary on the music and the miniatures were also produced by Samuel van Quickelberg, a Dutch adviser to the Duke. According to Quickelberg these compositions had been produced in response to a commission from the Duke and when, after his death in 1579, they were eventually published, with some changes, in a printed edition by Berg in Munich in 1584, Lassus’ preface refers to them having been composed about twenty-five years before and retained in the use of Duke Albrecht. This suggests that they were composed around 1559, shortly after Lassus’ first engagement by the Duke in 1556. Quickelberg refers to these compositions as ‘musica reservata’. Describing Lassus as the most distinguished and polished musician of the century, he says that Lassus’ music expresses the textual content of the Psalms so aptly with lamenting and plaintive tones, almost bringing the subject to life before one’s eyes, that it is difficult to say whether the emotions of the text more enhance the lamentation of the music or whether the lamentation of the music brings greater adornment to the text. This type of music they call ‘musica reservata’, he says, and in these and in his almost innumerable other compositions Lassus has amply shown to posterity the inimitable excellence of his genius. The definition of the term ‘musica reservata’ has been much debated by musicologists and different sources imply different meanings; but Quickelberg’s comments suggest that he intended to convey first that the music of these Psalms was, like much of Lassus’ music, especially responsive to the meaning of the text and used special techniques such as word-painting, sudden chordal shifts and changes of rhythm to bring this out; and secondly that, perhaps because it needed the informed knowledge of a musical connoisseur to appreciate these fully, this was a class of music often ‘reserved’ for use by a patron. Though he makes use of a wide variety of compositional techniques in his settings, Lassus builds an element of musical scaffolding into the cycle by composing each of the Psalms in a different musical church mode. The first Penitental Psalm is thus set in mode 1, sometimes termed the Dorian mode, the second in mode 2, the Hypodorian (transposed up a fourth), and so on until the last Psalm which is in mode 7, the Mixolydian. This left an untidiness in that there was no Penitential Psalm to take up mode 8, the Hypomixolydian. Lassus dealt with this by adding a setting of two Laudate Psalms in mode 8. There seems to have been no liturgical reason why he included the Laudate Psalms in the same publication as the Penitential Psalms, but they are less sombre in style than the Penitential Psalms and it is possible he did so partly in order to provide balance in the work as a whole. Dorian The first is meeke: devout to see. Hypodorian The second is sad; in maiesty. Phrygian The third doth rage: and roughly brayeth. Hypophrygian The fourth doth fawne: and flattry playeth. Lydian The fifth delighth: and laugheth the more. Hypolydian The sixth bewayleth: it weepeth full sore. Mixolydian The seventh tredeth stoute: in froward race. Hypomixolydian The eighth goeth milde: in modest pace. The two Laudate Psalms are written in a lighter vein and may happen to correspond to the designation of mode 8 by Hermannus Contractus, an eleventh-century theorist, as ‘joyful and exultant’, but it does not seem that Lassus’ settings of the Penitential Psalms really conform at all to the general character of these ‘affect’ descriptions and, given the uniformly sombre nature of the texts, this is scarcely surprising. What he was really interested in was the detailed shaping of each movement to the specific ideas in the text as these arose. Penitential Psalm No 1 (Psalm 6) is prescribed for Monday at Compline and also at Matins of the Office of the Dead. Lassus’ setting opens with a passage of sombre and slow-moving full harmony to set the mood of the cycle but he soon begins to introduce more movement and variety of texture. As in all the other settings of the cycle Lassus breaks the text up into a number of separate short sections, sometimes less than a verse in length, and employs constant changes of texture and sections for reduced voices to introduce variety and point up the character of each piece of the text. Within each section he constantly finds ways of illuminating particular words, such as the wonderful falling bass scale arriving at a deep B flat chord at the word ‘morte’ in the section beginning ‘Quoniam non est in morte’ or, in the last section before the Doxology, the sudden triple-time cross-rhythms at the words ‘et conturbentur vehementer’ and the flurry of quavers produced by the the words ‘valde velociter’. Penitential Psalm No 2 (Psalm 32) is prescribed for Monday at Matins and at Prime in the Commemoration of All the Faithful Departed (2 November). In this Psalm Lassus uses passages of sonorous homophony lightly seasoned with polyphony, more fugally conceived sections for all voices, short passages in triple time and reduced voice sections in a vigorous imitative style to keep the music moving forward. After a powerful homophonic Gloria the Psalm concludes, as do the others, with a final section in six voices of great expansiveness. Penitential Psalm No 3 (Psalm 38) is set for Matins on Maundy Thursday and is also used at Terce in the Commemoration of All the Faithful Departed. This setting makes a good deal more use of imitative voice-leading than the second Psalm but also includes effective passages of rapid homophony to illustrate ‘neque in ira tua’ and ‘impleti sunt illusionibus’, some beautifully written duos and trios in a strongly imitative manner and, again, a powerful six-part ending. Of the two Laudate Psalms, Psalm 148 is sung at Lauds on Christmas Day and during the Burial Service of Very Young Children. Psalm 150 is sung at Lauds on Holy Saturday and at Lauds in the Office of the Dead. It seems clear that Lassus regarded the two Laudate settings as effectively one unit because he follows the rather extraordinary procedure of beginning the second one in the middle of a section for reduced voices following the most perfunctory of cadences. The setting is divided into four long sections, the last of which is in six parts. Responding to the joyful nature of the text, the music is written in a lively style which balances the sombre mood of the Penitential Psalms. Penitential Psalm No 4 (Psalm 51) seems always to have attracted a great deal of devotional attention. There was a tradition of singing it in a fauxbourdon style of simple homophonic chanting often with alternate verses being sung to plainsong. Victoria produced a written-out alternatim setting in this manner. Savonarola, shortly before his execution in 1498, produced a meditation on the Psalm, entitled ‘Infelix ego’, which ends with its first sentence and was taken as motet text by both Byrd and Lassus. The Psalm is used in the Burial Service and the Office of the Dead as well as in Lent; and it is also prescribed in the traditional liturgy (considerably modified in 1955) for Holy Week for Lauds on Maundy Thursday, Good Friday and Holy Saturday. In the ‘Tenebrae’ ceremony of progressively extinguishing the lights in the church during the service, a set of fifteen candles mounted on a hearse (a triangular frame bearing fifteen candles) was placed in front of the altar. One candle was extinguished at the end of each Psalm until only the topmost candle remained lit. During the Benedictus the six candles on the altar were likewise extinguished one by one, from each side alternately at every second verse, so that by the last verse all were extinguished. All other lights in the church were also put out. Then, during the repetition of the Benedictus antiphon Traditor autem, this final lighted candle was hidden behind the altar, signifying Christ’s death. The verse of the antiphon ‘Christus factus est pro nobis obediens usque ad mortem’ was then chanted (extra words were prescribed for the two following nights) and then Psalm 51 was recited in a low voice, followed by the collect ‘Respice, quaesumus Domine’ and the prayer ‘Qui tecum vivit’. At the end of the prayer, a noise, signifying chaos, was made by knocking on the choir stalls until the remaining lighted candle reappeared from behind the altar, signifying Christ’s resurrection. All present then rose and retired in silence. Lassus’ setting of the Psalm draws on his usual range of techniques but reflects the fauxbourdon tradition in relying heavily on sombre homophonic or near-homophonic writing. Penitential Psalm No 5 (Psalm 102), one of the longest in the cycle, is sung at None in the Commemoration of All the Faithful Departed. Lassus uses the full range of his musical techniques to sustain interest and keep the music moving forward to an impressive six-part ending. Penitential Psalm No 6 (Psalm 130), the shortest, is sung at Vespers on Wednesday, during the Burial Service, and in the Office of the Dead at Vespers and Lauds. Lassus’ setting is unique in the cycle in that it is constructed around a cantus firmus, loosely based on the sixth Psalm tone, which figures in each of its eight sections. It appears first in the Baritone I part. In section 2 it is used in a canon between the Tenor and Baritone I parts. In section 3 it forms the basis of a canon by inversion between the same two voices. In section 4 it forms the structural basis of a short trio. In section 5 it migrates to the Bass, moving up, in slightly modified form, in the next section to the second Baritone part. The following trio and quartet display it in the top part and in the Doxology it returns to its original place in the first Baritone part. Penitential Psalm No 7 (Psalm 143) is set for Lauds on Good Friday and Compline in the Commemoration of All the Faithful Departed. In this Psalm Lassus returns to the use of the full range of musical devices, including some wonderful pieces of word-painting. These include a strongly syncopated setting in rapid motion of the words ‘turbatum est cor meum’ at the end the fourth section, similar treatment of the words ‘Velociter exaudi me, Domine’ in section 7; and a marvellous setting of the following phrase ‘defecit spiritus meus’, which begins after a rest in all parts, ends on an unstressed beat and is followed by a written-in bar’s rest in all parts. The Doxology provides a strong finish, with the Gloria beginning in steady, broad, near homophonic manner and the last section opening in a rather florid imitative style gradually bringing all the six parts into a sustained and sonorous ending. Orlande de Lassus, né en 1532 à Mons, dans le Hainaut, et mort le 14 juin 1594, à Munich, fut l’un des compositeurs les plus doués, les plus prolifiques et les plus cosmopolites de son temps. Quoique la légende veuille qu’il ait été enlevé à trois reprises à cause de la beauté de sa voix, nous ne possédons en réalité que peu d’indices précis quant à ses antécédents ou aux premières années de sa vie. Le premier fait attesté est son entrée, vers douze ans, au service de Ferrante Gonzaga, un général aux ordres de Charles V. Lorsque Gonzaga, qui se trouvait aux Pays-Bas durant l’été 1544, décida de repartir vers le sud, Lassus le raccompagna probablement en Italie, visitant Mantoue en 1545. Puis, Gonzaga se rendit à Milan, où Lassus aurait résidé de 1547 à 1549. Après un séjour napolitain, Lassus gagna Rome et fut nommé Maestro di Cappella à Saint-Jean-de-Latran, en 1553, juste avant Palestrina. Il occupa cette charge un peu plus d’un an, mais la quitta pour regagner sa patrie et apprendre à son arrivée que ses parents, malades, venaient de mourir. L’on entend ensuite reparler de lui à Anvers, en 1555, où Susato imprima un premier recueil de sa musique. L’année suivante, Lassus reçut, et accepta, une invitation à la cour du duc Albrecht V de Bavière, à Munich, où il fut engagé comme ténor sous la direction du Maestro di Cappella Ludwig Daser. En 1563, ce dernier se retira et Lassus lui succéda comme Maestro, poste qu’il ne quitta que trente ans plus tard, à sa mort, en 1594. Lassus écrivit une extraordinaire quantité de pièces de grande qualité, dans une diversité stylistique exceptionnelle, et fut fort estimé de son vivant, notamment de ses employeurs, le duc Albrecht, puis son fils et héritier Wilhelm, avec qui il entretint une correspondance animée, parfois rédigée dans un mélange de langues. Il fut manifestement estimé non seulement comme musicien doué et extrémement inventif, mais comme compagnon amusant, divertissant. Il atteignit à une renommée universelle, remporta plusieurs compétitions internationales pour ses compositions, et reçut les honneurs tant de l’empereur Maximilien, qui l’anoblit et lui octroya un blason en 1570, que du pape Grégoire XIII, qui le fit chevalier de l’Éperon d’or, à Rome, en 1574. La psalmodie, le chant des psaumes (la psalmodia grecque désignait originellement un chant accompagné par un instrument à cordes frappé ou pincé), était déjà centrale, et bien établie, dans la religion juive lorsqu’elle fut incorporée au culte de l’Église chrétienne primitive. Dès lors, elle se répandit rapidement à travers la chrétienté et des récits du IIIe siècle attestent combien elle était devenue courante. Les membres du clergé et des ordres monastiques devaient apprendre par cœur l’intégralité du psautier. Les ordres monastiques, surtout les bénédictins, encouragèrent l’incorporation du livre des psaumes à la liturgie occidentale, de sorte que les cent cinquante psaumes étaient récités chaque semaine – cette pratique perdura dans l’Église catholique romaine jusqu’à ce que la révision du bréviaire, en 1971, instaurât un cycle mensuel de lecture des psaumes. Dans l’Église anglicane, les psaumes ont été traditionnellement récités sur une base mensuelle, et la psalmodie a été une caractéristique importante des traditions protestante continentale et non-conformiste anglaise. En plus de former une partie de l’Office divin, les psaumes ont constitué la principale source textuelle des propres de la messe, tels l’introït, le graduel, l’offertoire et la communion, qui varient selon la saison de l’année liturgique et sont insérés entre les textes invariables de l’ordinaire de la messe (Kyrie, Gloria, Credo, etc.). Les sept psaumes pénitentiaux sont un groupe de psaumes – numéros 6, 32, 38, 51, 102, 130 et 143 dans la numérotation anglicane (numéros 6, 31, 37, 50, 101, 129 et 142 de la Vulgate) – dont l’usage liturgique pour la prière pénitentielle remonte aux premiers temps chrétiens; au Moyen Âge, l’on prescrivit leur récitation après les laudes des vendredis quadragésimaux. Le Book of Common Prayer les désigne comme des psaumes de propre pour le Mercredi des cendres: les psaumes 6, 32 et 38 à matines, le psaume 51 à la commination [dans l’Église anglicane, déclamation de la colère et des jugements de Dieu à l’encontre des pécheurs, récitée en particulier après le Mercredi des cendres], et les psaumes 102, 130 et 143 à l’Evensong. Quant à la liturgie catholique romaine post-tridentine, elle les utilise plus largement (voir infra, sous le titre de chaque psaume), conformément au missel publié par Pie V en 1570. La cour de Munich, qui avait jusqu’alors suivi le rite du diocèse de Freising, adopta la liturgie tridentine à Noël 1581. Lassus réalisa les mises en musique des sept psaumes pénitentiaux en même temps que celles des deux psaumes Laudate, savoir Laudate Dominum de caelis (psaume 148) et Laudate Dominum in sanctis eius (psaume 150). Elles parurent d’abord, peu après sa nomination au poste de Maestro (1563), sous forme de deux somptueux manuscrits, splendidement décorés et ornés de superbes enluminures du peintre de cour munichois Hans Mielich; copiés entre 1565 et 1571, ils étaient réservés à l’usage du duc Albrecht. Deux volumes de commentaires sur la musique et sur les miniatures furent également produits par Samuel van Quickelberg, un conseiller du duc, d’extraction néerlandaise. Selon lui, ces compositions répondaient à une commande du duc; ce dernier mort (en 1579), elles parurent, avec quelques modifications, dans une édition imprimée de Berg, à Munich, en 1584. La préface de Lassus les dit écrites quelque vingt-cinq ans auparavant et gardées pour l’usage du duc Albrecht, indiquant qu’elles furent produites vers 1559, peu après son premier engagement par le duc (en 1556). Quickelberg, qui les nomme «musica reservata», déclare que la musique de Lassus – à son sens, le musicien le plus distingué et le plus poli de son siècle – exprime si adéquatement le contenu textuel des psaumes, à l’aide de tons lamentables et plaintifs, donnant presque vie au sujet sous nos yeux, qu’il est difficile de dire si les émotions textuelles rehaussent la lamentation musicale ou si la lamentation musicale apporte un surcroît d’ornementation au texte. Ce type de musique est, selon lui, appelé «musica reservata» et, là comme dans ses innombrables autres compositions, Lassus a amplement montré à la postérité l’inimitable excellence de son génie. La définition de l’expression «musica reservata» a suscité de nombreux débats parmi les musicologues, différentes sources sous-entendant différentes significations; mais les commentaires de Quickelberg nous suggèrent qu’il souhaitait dire, en premier lieu, que la musique de ces psaumes était, comme celle de nombreuses pièces de Lassus, particulièrement sensible au sens du texte, usant de techniques spéciales (madrigalisme, soudaines transitions en accords et changements de rythme); et, en second lieu, qu’elle constituait – peut-être parce qu’elle ne pouvait être pleinement appréciée sans la culture d’un connaisseur en musique – une catégorie d’œuvres souvent «réservées» à un patron. Malgré l’extrême variété des techniques de composition utilisées dans ses mises en musique, Lassus érige un rudiment d’échaffaudage musical dans le cycle, en composant chaque psaume dans un mode ecclésiastique différent. Le premier psaume pénitential est, en conséquence, sis dans le mode 1 – parfois appelé mode dorien –, le deuxième dans le mode 2, le mode hypodorien (transposé à la quarte supérieure), et ainsi de suite jusqu’au dernier psaume, sis dans le mode 7, le mode mixolydien. Ce procédé laissait, cependant, le mode 8, le mode hypomixolydien, sans psaume pénitential, problème que Lassus résolut par l’adjonction d’une mise en musique, sise dans ledit mode 8, de deux psaumes Laudate. Aucune raison liturgique ne semble avoir motivé l’inclusion de ces psaumes dans le même recueil que les psaumes pénitentiaux; mais ils sont de style moins sombre que ces derniers et Lassus a pu agir ainsi en partie pour équilibrer l’œuvre dans sa globalité. Le Psaume pénitential no1 (psaume 6) est prescrit pour le lundi, à matines, et pour l’Office des morts, également à matines. La mise en musique de Lassus s’ouvre sur une harmonie sombre et lente, pour instaurer l’atmosphère du cycle, mais le compositeur commence bientôt à amener plus de mouvement et de variété de texture. Comme dans toutes les autres pièces de ce cycle, il scinde le texte en un certain nombre de courtes sections distinctes, faisant parfois moins d’un verset de long, et utilise de constants changements de texture et des sections pour voix réduites afin d’introduire de la diversité et de souligner le caractère de chaque passage du texte. À l’intérieur de chaque section, il trouve constamment le moyen d’enluminer des mots particuliers; pour preuve, la merveilleuse gamme de basse descendante, qui arrive à un accord de si bémol grave au mot «morte», dans la section débutant «Quoniam non est in morte», ou, dans la dernière section avant la doxologie, les soudains contre-rythmes ternaires aux mots «et conturbentur vehementer», et la rafale de croches produite par les mots «valde velociter». Dans le Psaume pénitential no2 (psaume 32/31) – prescrit pour le lundi, à matines, et à prime, lors de la Commémoration de tous les défunts (2 novembre) –, Lassus emploie des passages homophoniques sonores légèrement épicés de polyphonie, des sections pour toutes les voix, conçues de manière plus fuguée, de courts passages sis dans une mesure ternaire et des sections pour voix réduites écrites dans un vigoureux style imitatif afin de maintenir l’élan de la musique. Passé un puissant Gloria homophonique, ce psaume s’achève, comme les autres, sur une section finale à six voix, d’une grande expansivité. Le Psaume pénitential no3 (psaume 38/37), prescrit pour le Jeudi saint, à matines, est également requis à tierce, lors de la Commémoration de tous les défunts. Nonobstant un usage de la conduite des voix imitative beaucoup plus important que dans le deuxième psaume, il comprend d’efficaces passages d’homophonie rapide – pour illustrer «neque in ira tua» et «impleti sunt illusionibus» –, des duos et des trios magnifiquement composés dans un style fortement imitatif et, à nouveau, une puissante conclusion à six parties. Le Psaume 148 est chanté à laudes, le jour de Noël, et durant le service funèbre des petits enfants, cependant que le Psaume 150 est chanté à laudes, et le Samedi saint et lors de l’Office des morts. De toute évidence, Lassus considérait en fait ces deux psaumes comme une seule entité, comme l’atteste le recours à la procédure, plutôt extraordinaire, qui consiste à commencer le second psaume au milieu d’une section pour voix réduites, suivant la plus sommaire des cadences. La mise en musique est divisée en quatre sections longues, dont la dernière à six parties. Conformément à la nature joyeuse du texte, la musique est écrite dans un style animé, closant le cycle sur une atmosphère positive qui équilibre l’humeur sombre des psaumes pénitentiaux. Le Psaume pénitential no4 (psaume 51/50) semble avoir toujours attiré une grande attention dévotionnelle. On le chantait traditionnellement dans un style, en faux-bourdon, de chant homophonique simple, souvent avec un verset sur deux chanté en plain-chant – Victoria en produisit ainsi une mise en musique alternatim. Peu avant son exécution, en 1498, Savonarola consacra une méditation à ce psaume, intitulée «Infelix ego», qui s’achève sur sa première phrase et servit de texte de motet à Byrd et à Lassus. Ce psaume est utilisé lors du service funèbre et de l’Office des morts, ainsi qu’au carême; la liturgie traditionnelle (considérablement modifiée en 1955) le prescrit également pour la semaine sainte, pour les laudes des Jeudi, Vendredi et Samedi saints. Dans la cérémonie des «Tenebrae», qui consiste à éteindre progressivement toutes les lumières de l’église pendant le service, un ensemble de quinze chandelles montées sur une herse était disposé devant l’autel et une chandelle était éteinte à la fin de chaque psaume, jusqu’à ce que seule la chandelle du haut restât allumée. Durant le Benedictus, les six chandelles de l’autel étaient pareillement éteintes une à une, d’un côté puis de l’autre, à chaque deuxième verset, de sorte que toutes les chandelles étaient éteintes au dernier verset. Toutes les autres lumières de l’église étaient, elles aussi, éteintes. Puis, durant la répétition de l’antienne du Benedictus Traditor autem, la dernière chandelle allumée était cachée derrière l’autel, signifiant la mort du Christ. Le verset de l’antienne «Christus factus est pro nobis obediens usque ad mortem» était alors chanté (des mots supplémentaires étaient prescrits pour les deux nuits suivantes), avant une récitation à voix basse du psaume 51, suivie de la collecte «Respice, quaesumus Domine» et de la prière «Qui tecum vivit», au terme de laquelle un bruit, obtenu en cognant sur les stalles du chœur, venait évoquer le chaos jusqu’à la réapparition de la chandelle allumée, symbole de la résurrection du Christ. Toute l’assemblée se levait alors et se retirait en silence. La mise en musique du psaume se fonde sur l’habituel éventail de techniques de Lassus, mais reflète aussi la tradition du faux-bourdon, en reposant beaucoup sur une écriture homophonique, ou quasi homophonique, sombre. Dans le Psaume pénitential no5 (psaume 102/101), chanté à none lors de la Commémoration de tous les défunts, Lassus emploie toutes ses techniques musicales pour soutenir l’intérêt et conserver l’élan de la musique jusqu’à une impressionnante conclusion à six parties. Le Psaume pénitential no6 (psaume 130/129), le plus court des sept psaumes, est chanté à vêpres, le mercredi, pendant le service funèbre, et durant l’Office des morts, à vêpres et à laudes. Cette mise en musique est unique dans le cycle en ce qu’elle est construite autour d’un cantus firmus, librement fondé sur le sixième ton psalmodique, présent dans chacune des huit sections. Il apparaît d’abord dans la partie de baryton I, avant d’être utilisé, dans la section 2, dans un canon entre les parties de ténor et de baryton I. Dans la section 3, il constitue la base d’un canon renversé entre ces deux mêmes voix; dans la section 4, il est la base structurelle d’un bref trio. Dans la section 5, il migre jusqu’à la basse pour remonter, dans la section 6, sous une forme légèrement modifiée, jusqu’à la partie de baryton II. Le trio et le quatuor suivants le montrent dans la partie supérieure, tandis que la doxologie le voit retrouver sa place originelle, la partie de baryton I. Le Psaume pénitential no7 (psaume 143/142) est prescrit pour laudes, le Vendredi saint, et pour complies, lors de la Commémoration de tous les défunts. Lassus revient à un usage de tous les différents procédés musicaux, dont quelques merveilleux madrigalismes: une mise en musique rapide, fortement syncopée, des mots «turbatum est cor meum», à la fin de la quatrième section, et des mots «Velociter exaudi me, Domine», dans la section 7; une merveilleuse mise en musique de la phrase suivante «defecit spiritus meus», qui débute après une pause dans toutes les parties, s’achève sur un temps non accentué, et est suivie d’un silence pour toute une mesure, dans toutes les parties. La doxologie fournit une conclusion puissante, le Gloria commençant d’une manière régulière, ample, quasi homophonique, cependant que la dernière section s’ouvre dans un style imitatif assez fleuri, amenant progressivement les six parties à une fin tenue et sonore. Orlando di Lasso wurde um 1532 in Mons (Hainaut/ Belgien) geboren und verstarb am 14. Juni 1594 in München. Er war einer der begabtesten, produktivsten und kosmopolitischsten Komponisten seiner Zeit. Es heißt zwar von ihm, er sei dreimal aufgrund der Schönheit seiner Stimme entführt worden, allerdings gibt es keine konkreten Anhaltspunkte bezüglich seiner Vorgeschichte oder seines früheren Lebens. Er findet erstmalig urkundliche Erwähnung, als er im Alter von etwa zwölf Jahren in den Dienst von Ferrante Gonzaga trat, der Karl V. als General unterstand. Im Sommer 1544 befand sich Gonzaga in den Niederlanden, und als dieser nach Süden zurückkehrte, scheint ihn Lasso wohl bis nach Italien begleitet zu haben, wo er im Jahre 1545 Mantua besuchte. Gonzaga zog weiter nach Mailand, und auch von Lasso nimmt man an, er habe dort die Jahre 1547 bis 1549 verbracht. Nach einer Weile in Neapel ging Lasso nach Rom, wo er 1553 als unmittelbarer Vorgänger Palestrinas zum Kapellmeister der St. Johannes-Laterankirche ernannt wurde. Nach etwas mehr als einem Jahr gab er diesen Posten wieder auf, um in seine Heimat zu seinen kranken Eltern zurückzukehren, die aber bei seiner Ankunft bereits beide verstorben waren. Die nächste Erwähnung findet Lasso 1555 in Antwerpen, wo Susato eine erste Sammlung seiner Musik druckte. Im darauffolgenden Jahr erhielt Lasso eine Einladung nach München an den Hof von Herzog Albrecht V. von Bayern, wo er als Tenor unter Kapellmeister Ludwig Daser engagiert wurde. Im Jahre 1563, als sich Daser zur Ruhe setzte, übernahm Lasso den Posten als Maestro, den er die nächsten dreißig Jahre bis zu seinem Tode 1594 innehaben sollte. Lasso komponierte eine außerordentliche Menge qualitativ hochwertiger Musik in einer Vielzahl an Stilen. Zeit seines Lebens genoß er hohes Ansehen, insbesondere bei seinem Arbeitgeber, Herzog Albrecht, und schließlich auch bei dessen Sohn und Nachfolger Wilhelm, mit dem Lasso eine lebhafte Korrespondenz führte, manchmal in einem Gemisch aus verschiedenen Sprachen. Man sah in ihm offensichtlich nicht nur einen begabten und äußerst einfallsreichen Musiker, sondern auch einen lustigen und unterhaltsamen Freund. Er kam über die Landesgrenzen hinaus zu Ruhm, gewann mehrere internationale Kompositionswettbewerbe, und wurde von Kaiser Maximilian geehrt, der ihn 1570 in den Adelsstand erhob und mit einem Wappen auszeichnete, ebenso wie von Papst Gregor XIII., der ihn 1574 in Rom zum Ritter des goldenen Sporn schlug. Die Psalmodie, das Singen von Psalmen (im Griechischen bedeutete das Wort psalmodia ursprünglich Singen in Begleitung eines Streich- oder Saiteninstrumentes), war zum Zeitpunkt, als sie ihren Weg in die Gottesdienste der christlichen Kirchen fand, bereits fest im Judentum verankert, wo sie eine zentrale Rolle einnahm. Rasch breitete sich das Psalmsingen über die christliche Welt aus; Aufzeichnungen aus dem dritten Jahrhundert bestätigen, wie weit verbreitet dieser Brauch inzwischen war. Von Angehörigen der Geistlichkeit und der Mönchsorden erwartete man, daß sie den gesamten Psalter auswendig kannten. Die Mönchsorden, insbesondere die Benediktiner, förderten die Eingliederung des Psalters in die Westliche Liturgie, so daß alle 150 Psalmen wöchentlich rezitiert wurden – ein Brauch, der sich in der römisch-katholischen Kirche bis zur Überarbeitung des Breviers im Jahre 1971 hielt, wonach von da an die Psalmlesungen nur noch einmal monatlich vorgeschrieben sind. In der anglikanischen Kirche waren die Psalmen von Anfang an monatlich angesetzt; die Psalmodie ist auch in der protestantischen Kirche Kontinentaleuropas und bei den englischen Nonkonformisten ein wesentliches Merkmal. Die Psalmen sind aber nicht einfach nur Teil des Gottesdienstes, sondern stellen die Hauptquelle für Texte zur eigentlichen Messe dar, so zum Beispiel der Introitus, das Graduale, das Offertorium sowie die Kommunion, die je nach Abschnitt des Kirchenjahres variieren und zwischen die gleichbleibenden Texte des Ordinarium Missae gesetzt werden – Kyrie, Gloria, Credo usw. Die sieben Bußpsalmen sind eine Gruppe von Psalmen – Nummern 6, 32, 38, 51, 102, 130 und 143 nach der anglikanischen Numerierung (in der Vulgata sind alle mit Ausnahme von Psalm 6 eine Nummer tiefer) – die seit dem frühen Christentum zu Bußgebeten in der Liturgie eingesetzt wurden; im späten Mittelalter rezitierte man sie an Freitagen während der Fastenzeit nach den Laudes. Im Allgemeinen Gebetbuch werden diese als Psalmen für Aschermittwoch aufgeführt, die ersten drei in der Frühmette, Psalm 51 bei der Kommination sowie die letzten drei beim Abendgottesdienst. In der Zeit nach dem von Papst Pius V. im Jahre 1570 eingeführten Meßbuch zur tridentinisch-römisch-katholischen Liturgie wurde in zunehmenden Maße Gebrauch von Bußpsalmen gemacht. Dies wird im folgenden unter der Überschrift eines jeden Psalms beschrieben. Zu Weihnachten 1581 übernahm der Münchner Hof, der bis dahin den Riten der Diözese Freising gefolgt war, die tridentinische Liturgie. Lasso schuf neben zwei Lobgesängen, dem Laudate Dominum de caelis (Psalm 148) und dem Laudate Dominum in sanctis eius (Psalm 150), auch Vertonungen für alle sieben Bußpsalmen. Diese erschienen erstmalig kurz nach seiner Ernennung zum Kapellmeister im Jahre 1563 in Form zweier aufwendig gestalteter Manuskripte, die vom Münchner Hofmaler Hans Mielich durch herrliche Illuminationen verschwenderisch ausgeschmückt und verziert worden waren. Zwischen 1565 und 1571 stellte man Kopien her, die ausschließlich der Nutzung durch Herzog Albrecht vorbehalten waren. Zwei Begleitbände mit Erläuterungen zur Musik und den Miniaturen wurden darüber hinaus von Samuel van Quickelberg geschaffen, einem Berater des Herzogs niederländischer Abstammung. Laut Quickelberg wurden diese Kompositionen in Folge eines Auftrages des Herzogs geschaffen, und nach seinem Tod im Jahre 1579 mit einigen Abänderungen letztendlich in gedruckter Ausgabe 1584 von Berg in München veröffentlicht. Lassos Vorwort zufolge wurden sie bereits fünfundzwanzig Jahre früher komponiert und waren seither im Besitz von Herzog Albrecht I. Demnach wurden sie um 1559 komponiert, kurz nach Lassos erstem Engagement durch den Herzog im Jahre 1556. Quickelberg bezeichnet diese Kompositionen als „musica reservata“. Lasso beschreibt er als den markantesten und raffiniertesten Musiker jenes Jahrhunderts, und fügt hinzu, daß Lassos Musik durch die Verwendung klagender und schwermütiger Töne den Textgehalt der Psalmen so passend ausdrückt, daß dem Zuhörer das Thema fast direkt vor Augen erscheint, so daß es nicht leicht zu sagen ist, ob nun die Emotionen des Textes das Klagelied verstärken oder ob das Klagelied die Emotionen des Textes unterstreicht. Diese Art der Musik werde „musica reservata“ genannt – so fährt er fort – und darin, wie auch in nahezu unzähligen anderen Kompositionen, hinterließ Lasso der Nachwelt in großem Maße die unnachahmliche Vorzüglichkeit seiner Schöpferkraft. Um die Definition des Begriffes „musica reservata“ wurde unter Musikologen schon viel diskutiert, und verschiedene Quellen geben unterschiedliche Erklärungen. In seinen Erläuterungen versucht Quickelberg zunächst darzustellen, daß die Psalmen, wie die meisten musikalischen Werke Lassos, speziell auf die Inhalte der Texte ansprechen, wobei er besondere Techniken verwendete, wie die Tonmalerei, plötzliche akkordische Lagenwechsel sowie Veränderungen des Rhythmus, um dies hervorzubringen. Des weiteren, so Quickelberg, handelt es sich hierbei um eine Klasse von Musik, die vielleicht weil sie nach dem fachkundigen Wissen eines Musikkenners verlangte, damit man sie voll genießen kann, oft nur Mäzenen vorbehalten war. Lasso verwendet in seinen Vertonungen eine große Bandbreite an Kompositionstechniken und schafft in diesem Zyklus ein musikalisches Gerüst, indem er jeden der Psalmen in einem anderen musikalischen Kirchenmodus komponiert. Der erste Bußpsalm ist demnach in Modus 1, der auch als dorischer Modus bezeichnet wird, der zweite in Modus 2, dem hypodorischen Modus (der eine Quarte höher gesetzt wird), und so weiter bis zum letzten Psalm in Modus 7, dem mixolydianischen Modus. Es gab aber eine kleine Unregelmäßigkeit, und zwar, daß es keinen Bußpsalm in Modus 8, dem hypomixolydianischen Modus, gab. Lasso fügte statt dessen zwei Lobgesänge in Modus 8 hinzu. Es scheint wohl hinsichtlich der Liturgie keinen Grund dafür zu geben, warum er die Lobgesänge in das selbe Werk wie die Bußpsalmen eingebettet hat; sie sind jedenfalls längst nicht so düster wie die Bußgesänge, und ein Grund für ihre Verwendung mag möglicherweise gewesen sein, daß er insgesamt eine Balance im Werk erzeugen wollte. Bußpsalm Nr. 1 (Psalm 6) ist für die Komplete an Montagen sowie für Frühmetten und Totenmessen bestimmt. Lassos Vertonung beginnt mit einer Passage einer ruhigen und langsam gleitenden, vollkommenen Harmonie, die die Stimmung des Zyklusses festlegen soll; bald schon aber setzt er mehr Bewegung und eine Reihe verschiedener Strukturen ein. Wie auch in allen anderen Vertonungen dieses Zyklusses, teilt Lasso den Text in kleine, separate Abschnitte auf, die zum Teil kürzer als ein ganzer Vers sind. Zudem verwendet er zur Abwechslung und zur Betonung des Charakters jedes Textabschnittes ständige Wechsel der Struktur sowie Abschnitte für eine geringere Zahl von Stimmen. Zu jedem Abschnitt findet er stets eine Möglichkeit zur Betonung bestimmter Wörter, so zum Beispiel die wunderbar bis zum tiefen B-Akkord abfallende Baßtonleiter beim „morte“ in jenem Abschnitt, der mit den Worten „Quoniam non est in morte“ beginnt, oder auch der plötzliche Tripeltakt-Gegenrhythmus zu den Worten „et conturbentur vehementer“ im letzten Abschnitt vor der Lobpreisung, sowie die hektischen Achtelnoten, die durch „valde velociter“ hervorgerufen werden. Bußpsalm Nr. 2 (Psalm 32/31) ist für Frühmetten an Montagen wie auch zur Prim an Allerseelen (2. November) vorgeschrieben. Bei diesem Psalm macht Lasso Gebrauch von Passagen sonorer Homophonie, die einen leichten Anklang an Mehrstimmigkeit mit sich bringen, sowie von auf Fugen abgestimmte Abschnitte für alle Stimmen, kürzere Passagen im Tripeltakt und Abschnitte für weniger Stimmen in einem schwungvoll nachahmenden Stil, der die Musik weiterhin nach vorne treibt. Nach einem kraftvollen Gloria endet der Psalm, wie auch in den anderen Psalmen, mit einem Schlußabschnitt in sechs Stimmen großer Offenheit. Bußpsalm Nr. 3 (Psalm 38/37) ist für die Frühmette am Gründonnerstag konzipiert, und wird auch zur Terz an Allerseelen verwendet. Bei dieser Vertonung wird die nachahmende Stimmführung wesentlich ausgiebiger verwendet als im zweiten Psalm; sie enthält zur Illustration von „neque in ira tua“ und „impleti sunt illusionibus“ auch wirkungsvolle Passagen rascher Homophonie, herrlich komponierte Duos und Trios in stark nachahmender Manier, sowie wiederum einen kraftvollen, sechsteiligen Schluß. Psalm 148 wird zu Lobgesängen am Weihnachtstag und zu Trauerfeiern für sehr jung verstorbene Kinder gesungen. Psalm 150 wird als Lobgesang am Karsamstag und zu Totenmessen gesungen. Es scheint offensichtlich, daß Lasso die Vertonung der beiden Lobgesänge als in Wirklichkeit eine Einheit betrachtete, da er dabei ziemlich außergewöhnlich verfährt und den zweiten Abschnitt in der Mitte eines Abschnitts für eine reduzierte Stimmzahl nach ein paar flüchtigen Kadenzen beginnen läßt. Die Vertonung ist in vier lange Abschnitte unterteilt, wovon der letzte sechs Teile hat. Die Musik entspricht dem frohen Wesen des Textes und ist in einem lebhaften Stil verfaßt, der den Zyklus auf positive Weise abrundet, womit die triste Stimmung der Bußgesänge aufgewogen wird. Bußpsalm Nr. 4 (Psalm 51/50) hat wohl schon seit jeher eine große hingebungsvolle Anziehungskraft besessen. Es gibt eine Gesangstradition im Fauxbourdon-Stil der unkomplizierten, homophonen Gesänge, die häufig mit sich abwechselnden Versen zum Cantus planus gesungen wurden. Victoria stellte eine alternative, ausgeschriebene Vertonung in dieser Art dar. Savonarola legte kurz vor seiner Hinrichtung im Jahre 1498 eine Meditation zu diesem Psalm mit dem Titel Infelix ego vor, welche mit seinem ersten Satz endet und von Byrd und Lasso als Motettentext übernommen wurde. Der Psalm wird sowohl bei Begräbnissen und Totenmessen als auch während der Fastenzeit verwendet, zudem ist er zur traditionellen Liturgie (die 1955 wesentlich modifiziert wurde) in der Karwoche für Preisungen am Gründonnerstag, Karfreitag und Karsamstag vorgeschrieben. Während der „Tenebrae“-Zeremonie, bei der nach und nach alle Lichter in der Kirche gelöscht werden, plazierte man einen mit fünfzehn Kerzen bestückten, dreieckigen Rahmen vor dem Altar. Zum Ende eines jeden Psalms wurde eine Kerze gelöscht, bis nur noch die oberste brannte. Bei den Benediktinern wurden in ähnlicher Weise die sechs Kerzen auf dem Altar nacheinander gelöscht, jeweils abwechselnd von links und rechts zu jedem zweiten Vers, so daß zum letzten Vers alle ausgelöscht waren. Auch alle anderen Lichter in der Kirche wurden ausgemacht. Zur Wiederholung des Benedictus-Antiphons Traditor autem, wurde die letzte brennende Kerze hinter dem Altar versteckt, um den Tod Christi zu symbolisieren. Dann sang man den Vers des Antiphons „Christus factus est pro nobis obediens usque ad mortem“ (für die beiden folgenden Abenden waren zusätzliche Worte vorgeschrieben) und der Psalm 51 wurde in tiefer Stimme rezitiert, gefolgt von einem kollektiven „Respice, quaesumus Domine“ und dem Gebet „Qui tecum vivit“. Gegen Ende des Gebets wurde zur Versinnbildlichung des Chaos laut gegen den Chorstuhl geklopft, bis schließlich die noch brennende Kerze wieder hinter dem Altar erschien und somit die Auferstehung Christi symbolisierte. Daraufhin erhoben sich alle Anwesenden und schwiegen. Lasso verwendet bei der Vertonung dieser Psalmen die üblichen Stilmittel, er spiegelt aber auch die Fauxbourdon-Tradition wider, indem er beim Schreiben voll auf düstere Homophonien und Fast-Homophonien setzt. Bußpsalm Nr. 5 (Psalm 102/101) wird zur None an Allerseelen gesungen. Lasso setzt dabei eine große Bandbreite an musikalischen Techniken ein, um das Interesse aufrechtzuerhalten und die Musik weiterhin nach vorne zum sechsstimmigen Ende zu treiben. Bußpsalm Nr. 6 (Psalm 130/129) wird zu Vespern am Mittwoch, zu Begräbnissen sowie bei Totenmessen zur Vesper und bei den Laudes gesungen. Lassos Vertonung ist in diesem Zyklus insofern einzigartig, als daß sie um einen Cantus firmus aufgezogen wurde, welcher frei auf dem sechsten Psalmton basiert, der in allen acht Abschnitten erscheint. Erstmals tritt er in der ersten Baritonpartie auf. In Abschnitt zwei findet er als Kanon zwischen der Partie für Tenor und der ersten Baritonpartie Verwendung. Im dritten Abschnitt bildet er durch Umkehrung zwischen den beiden gleichen Stimmen die Grundlage eines Kanons. In Abschnitt vier bildet der Psalmton die Grundstruktur für ein kurzes Trio. Im fünften Abschnitt wandelt er sich zum Baß, und bewegt sich im darauffolgenden Abschnitt in leicht veränderter Gestalt nach oben zur zweiten Baritonpartie. Im folgenden Trio und Quartett erscheint er in der Oberstimme; in der Doxologie kehrt der Psalmton zu seinem Ursprung in der ersten Baritonpartie zurück. Bußpsalm Nr. 7 (Psalm 143/142) kommt bei den Laudes am Karfreitag sowie beim Komplet an Allerseelen zum Einsatz. Bei diesem Psalm kehrt Lasso zur Verwendung des gesamten musikalischen Repertoires zurück, darunter einige wunderbare Beispiele an musikalischer Wortmalerei. So gibt es zum Beispiel eine stark synkopierte und schwungvolle Inszenierung der Worte „turbatum est cor meum“ gegen Ende des vierten Abschnittes, eine ähnliche Bearbeitung der Worte „Velociter exaudi me, Domine“ in Abschnitt sieben; sowie eine herrliche Vertonung des darauffolgenden „defecit spiritus meus“, das nach einer Pause in allen Stimmen einsetzt, mit einem unbetonten Takt endet und in allen Stimmen von eingefügten Taktpausen gefolgt wird. Die Doxologie bietet einen kräftigen Schluß, wobei das Gloria auf solide, breite und fast schon homophone Weise beginnt, und der letzte Abschnitt mit einem eher blumigen, nachahmenden Stil alle sechs Partien allmählich zu einem ausdauernden und klangvollen Abschluß führt.